Electropolishing is the ultimate process in the surface finishing of stainless steel and produces a superior finish with unique properties. The process is carried out by immersion in a tank with an electrolyte and a rectifier. Having the opposite effect of electroplating, the process removes a layer of material, between 5 to 40um (microns). As the process has no impact to the surface, the process solution temperature is far below the critical structure formation zone. This renders the surface pure and chemically clean and thus undisturbed, crystalline structures are exposed. These surfaces have several features and characteristics unmatched by any other finishing process. As the electropolishing process employs current, the fixtures which hold components need to be conductive. 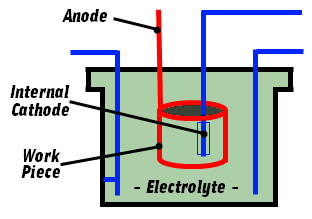 Electrolytes are a mixture of high concentration acids which readily attack most conductive metals. Sacrificial copper fixtures are often employed and benefit from its high conductivity. Titanium is used in high volume applications as it is resistant to the acids and produces an inert oxide under process conditions. By removing the damaged and contaminated surface layers, the process exposes pure crystalline, ultra clean base material. This restores the original properties of the material and makes the surface suitable for ultra-clean applications. Further more, external surface stresses in the upper layers are relieved. Component sizing may also be undertaken by employing tightly controlled parameters. 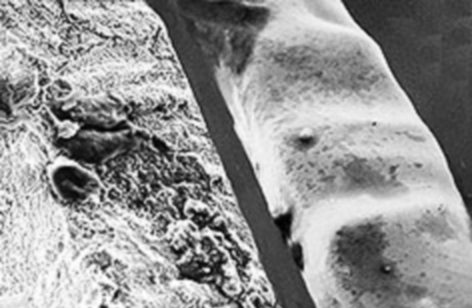 The flow of the current and the natural action is to remove the peaks at a faster rate than the troughs on the surface topography, leading to the elimination of micro roughness and has a further feature of deburring. Additionally, the surface is super smooth, making it hard for deposits and residues to attach themselves which makes the surface exceptionally easy to clean. Selective removal of iron, enriches the surface with Chromium and Nickel. Oxygen Is then liberated at the positive side of the Electrolytic process. Thus, oxidising recently exposed layers, further improving the corrosion resistance. Anokap Solutions (Thailand) Co., Ltd.